Leo never imagined that time travel might really be possible, or that the objects in H. G. Wells’ science fiction novels might actually exist. And when a miniature time machine appears in Leo’s bedroom, he has no idea who the tiny, beautiful girl is riding it. But in the few moments before it vanishes, returning to wherever—and whenever—it came from, he recognizes the other tiny rider: himself! 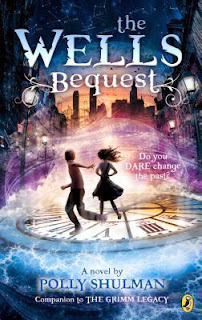 His search for the time machine, the girl, and his fate leads him to the New-York Circulating Material Repository, a magical library that lends out objects instead of books. Hidden away in the Repository basement is the Wells Bequest, a secret collection of powerful objects straight out of classic science fiction novels: robots, rockets, submarines, a shrink ray—and one very famous time machine. And when Leo’s adventure of a lifetime suddenly turns deadly, he must attempt a journey to 1895 to warn real-life scientist Nikola Tesla about a dangerous invention. A race for time is on! In this grand time-travel adventure full of paradoxes and humor, Polly Shulman gives readers a taste of how fascinating science can be, deftly blending classic science fiction elements with the contemporary fantasy world readers fell in love with in The Grimm Legacy. Polly Shulman has edited and written articles about books, infinity, edible jellyfish, planets, circuses, and many other subjects for the New York Times, Science, Salon, and many other publications. She is an alumna of Yale, where she majored in math. She puts cayenne pepper in her chocolate cookies and reads forgotten books with frontispieces. In high school she worked as a page at the New York Public Library's main branch, where the librarians trusted her with the key to the special materials storage cage. She lives in New York City with her husband. I love the fairytale part. I like these books because there are about the Grimm Fairy Tales and Contemporary Fantasy also with Time Traveling that is so cool! thanks for the great giveaway! 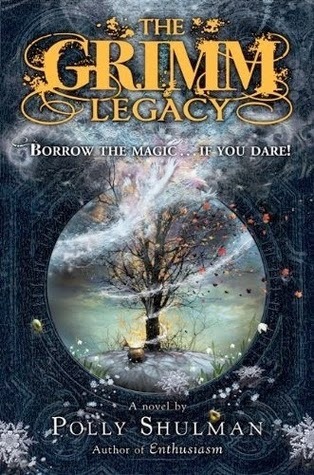 I love that it has elements of the Grimm fairytales in it. I cant wait to read the authors take on them. I really like the fantasy and the time travel in the one novel. I love that it's about the Grimm fairy tales and looks like a cute series. I love Grimm fairytales and retellings are always so much fun! OHHHH! LOVE the way this book sounds!!!! I like that they involve a library!